Second novelty SIHH 2013 of Greubel Forsey Double Tourbillon Technique clock Black, in addition to being the first black timepiece collection, it is also the first model to be equipped with a titanium case and a rubber strap. The clock is moved from the first “crucial invention “of the two brilliant watchmakers: the Double Tourbillon 30 °. The sapphire glass allows you to see at 6 o’clock in detail the evolution of the two synchronized cages regulatory mechanisms. Hours and minutes are indicated by two hands pierced, typical of the style of the brand, which refer to a ring of sapphire. Turning our gaze again at 6 o’clock a star sapphire with four red tips, related to the outer tourbillon, which rotates once every 4 minutes, and thanks to a series of gears – the small seconds are indicated in a subdial at 9 o’clock. Four coaxial barrels provide plenty of energy for a constant power reserve of 120 hours. They are quick rotation and their movement can be seen during both charging and when it is running low. The spherical differential drives the indicator of power reserve. Lately very fashionable in Haute Horlogerie, the Double Tourbillon Technique Black is a sophisticated three-dimensional example of watchmaking. For lack of a quadrant traditional components of Caliber arranged frontally are placed on different levels specifically to create a marked effect of depth to the viewer. When you choose this route you can obviously pay close attention to detail finishing all the elements of the art. As for now the only photo available shows the result obtained from this Double Tourbillon is truly remarkable, and even better to be observed the kinetics of the two cages going each time to discover new details in everything that surrounds them. 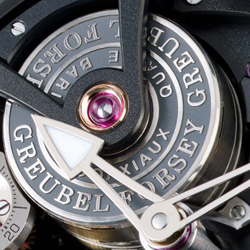 The Double Tourbillon 30 °, presented in 2004, is the first crucial invention of Greubel Forsey. Inside a cage that rotates in four minutes, is positioned a second cage smaller, inclined at 30 degrees with respect to the first and containing the rocker arm and the spiral, which performs a revolution in 60 seconds. This combined solution enables not only to correct errors caused by the spiral that can assume different postures while moving antero-posterior – thing that manages to solve even a single tourbillon – but the second cage is able to adjust the interference that are needed to regularity of the oscillations, even when derived from other inclinations. As these benefits are found set in concrete – if the regular operations is tested in 6 positions – one, two, three tourbillon – and even four if you want to have an exclusive Greubel Forsey – are in fact all mechanical complications “spectacular” and demonstrate the ability of the watchmakers who created them, rather than being a permanent remedy to the lack of precision absolute characteristic of a mechanical watch. 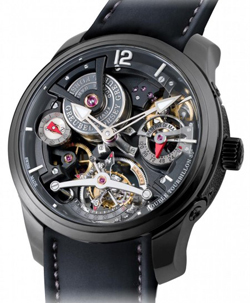 Like all the timepieces Greubel Forsey Double Tourbillon Technique Black is really polished to perfection. The hands of the central hour and minute gold skeleton and filled with white Super-LumiNova create a strong and pleasant contraso black chrome on the move. The hands of the triangular small seconds and power reserve indicator are aluminum Peraluman red. The small seconds dial is made of a single piece of gold (such as dial-reserve) whose perimeter ring is rhodium indexes with engraved and lacquered. Above the flange of the dial is set to open a ring shaped sapphire metallic with applied indices as the loops titanium are applied at checkout. The buckle clasp treated titanium black Greubel Forsey is composed of a double clasp mechanism with opening by buttons for added security. As described in more high finishes in a three-dimensional clock must necessarily be cured, but in the end they themselves make the whole difference. As always confirmed then 100% live, the photo taken in the studio does not allow you to fully appreciate the finishes that this brand has accustomed us to see so far, so I will just return the description given by the house. The plates are machined to grenage, steel is polished flat and curved surfaces, chamfering the corners are done by hand, rubies are placed in settings of gold polished screws were finished with chamfered, polished and blued. In conclusion, this new SIHH 2013 – in which the manufacturer has faced for the first time the “all black” – seems deliberately very discreet if you view it from afar, but as he wants a piece of this rank, really spectacular when it is within range of hand.